The West Howe Sound Regatta at Gibson's Landing, c. 1930s. ​This weekend marks the 50th anniversary of Sea Cavalcade, one of the biggest summer events on the coast. Before Sea Cavalcade began, every community had a different celebration: Sechelt had May Day, Gibsons had Dominion Day (July 1), and Port Mellon had Labour Day. ‘The West Howe Sound Regatta’ (pictured above) was another summer celebration held alternately in the communities of Gibsons, Granthams, and Hopkins Landing. It started in the late 1920s, and continued throughout the ‘30s and ‘40s. Finally, in 1968, event organizers decided to create a celebration that would bring all of these communities together. Sea Cavalcade was declared officially opened in 1969 by BC Premier W. A. C. Bennett. While the events of Sea Cavalcade have evolved over the years, the basic structure has remained the same. Perhaps the longest running tradition is the Sea Cavalcade parade, where community members and organizations come together for a march through Gibson’s Landing. The fireworks display has also been an integral part of Sea Cavalcade since the beginning. 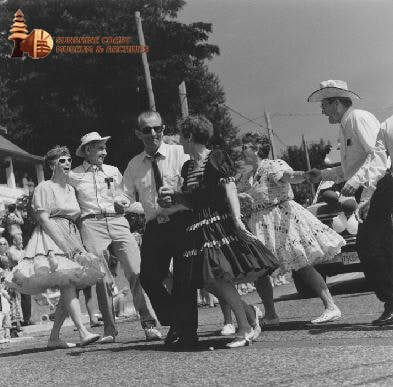 Similar to Sea Cavalcade 2018, early celebrations included live music and dances throughout the weekend. Other events, such as the pancake breakfast and the salmon barbeque, have also remained a important part of the community involvement in Sea Cavalcade. "World's Largest" Tugboat Race, c. 1970. The seaside location of Sea Cavalcade and its predecessors meant that many events took place on the waters of the Shoal Channel. The “World’s Largest” Tugboat Race (pictured above) was a Sea Cavalcade staple for the first 10 years of the festivities. The infamous ‘Boat Blow-Up’ began in 1970, when a run-down boat was set up with explosives. These were two of the most popular events until both were cancelled in 1979, as captains of the tugboats were met with insurance difficulties and the boat blast resulted in shattered windows from the Bluff to Granthams. However, the special effects crew of ‘The Beachcombers’ brought the revival of the ‘Boat Blow-Up’ in 1981, using fewer explosives. This event remained a crowd favourite until it was cancelled again in recent years. ​Another signature Sea Cavalcade event that has withstood the test of time is the crowning of the Sea Cavalcade Queen (also known as 'Miss Sea Cavalcade' or ‘Royal’) and princess. In early years, young women representing local businesses or organizations would compete for the title. Another title, “Sea Cavalcade Golden Girl”, was first awarded in 1987. This title focuses on recognizing women who have contributed to improving the quality of life on the Sunshine Coast. There have been so many events over the last five decades it would be impossible to name them all! The future of Sea Cavalcade is guaranteed to change and evolve with the communities of the Sunshine Coast. But the annual celebration of Sea Cavalcade has been a tradition for five decades, and I can't wait to see what the next fifty years will bring. I can’t believe it’s my last day! For my final blog post, I wanted to reflect on my time here at the museum and say thank you. I’ve had a great time this summer! I am incredibly grateful that I had the opportunity to spend my summer learning and working with such a passionate group of people. During my time at the Sunshine Coast Museum & Archives, I have learned an incredible amount about the history of the Sunshine Coast, but also about technical aspects of a museum. It’s fascinating to learn more about the community you were raised in, and this has been an amazing experience. I was also able to gain experience working with photo negatives, collections care/documentation, writing blog posts and a newspaper article! A special thank you to Matthew, Marci, and Gary for being so welcoming. I had a wonderful time getting to know all of you, and I couldn’t have asked for a better team to be a part of. To everyone else that I worked with, it was a pleasure to meet you and I hope to see you around soon! And a final thank you to everyone who visited the museum this summer, we wouldn't be here without your support. I’ll definitely be back, and I look forward to seeing everyone again! The guiding principles here at the Sunshine Coast Museum & Archives are to inspire curiosity, involve our community, and share our story. Our latest exhibit, ‘Fixed’, demonstrates all three by exploring the community conversation about creating a fixed link to the Sunshine Coast. 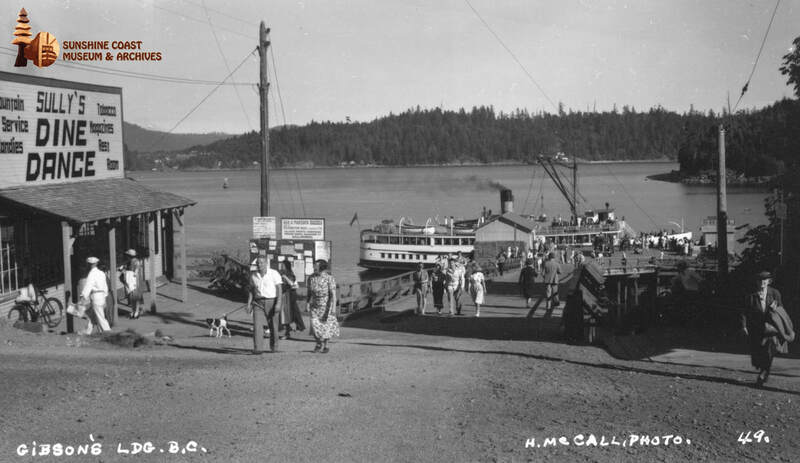 The discussion of a permanent, drivable connection to the Sunshine Coast began in the 1950s, with the introduction of car ferries. While residents would have to wait for up to three days for travel by steamships, the new ferries allowed for quick transportation to and from the Lower Mainland. The influx of visitors began, and this ease of transportation changed life on the coast dramatically. To see how the fixed link story has evolved, we included local news articles dating back to the 1950s. Since then, the community dialogue has continued- often when difficulties in ferry service arise. How would the fixed link to the Sunshine Coast affect your life? How do you think it would impact the communities of the Sunshine Coast? The province is in the process of completing a feasibility report that highlights two possible links: a bridge to Anvil Island and a road connecting Langdale to Squamish. The importance of community involvement is highlighted in our exhibit through a video created in collaboration with students from Elphinstone Secondary, Coast TV, and the Elphinstone TV Club. Students Mary Thompson and Sarah Macey conducted Interviews of fellow students, discussing BC ferries and the possibility of a fixed link. There is also a whiteboard mounted among the exhibit, encouraging visitors to share their thoughts on a permanent connection to the mainland. We take pictures weekly and have included a selection of photos from the board below. The Sunshine Coast is a unique community, and our location is a big part of our story: not the island and not quite the mainland- our own peninsula. The community conversation surrounding a fixed link has been around for decades, with no end in sight. Will it ever be built? ​Drop by the museum Tuesday through Saturday, 10:30-4:30 and join the conversation! Have you ever wanted to know more about the evolution of medical care on the Sunshine Coast? How did we evolve from a small, rural community with one doctor, to where we are today? I'm in the nursing program at the University Of British Columbia (Kelowna), and was interested in how our local health services came to be. During my time here at the museum, I decided to find out! 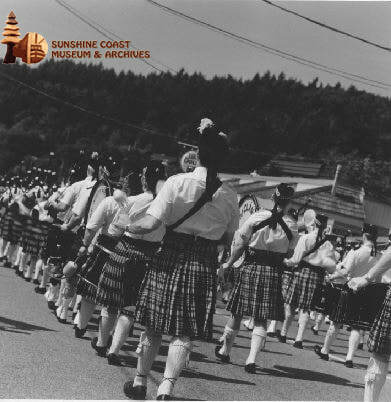 ​​In 1913, Dr. Frederick Inglis arrived in Gibsons and opened the first medical clinic of the Sunshine Coast. He operated his clinic and a pharmacy out of his home, Stonehurst, in Gibson's Landing. For the next 33 years, Dr. Inglis travelled throughout the coast to provide medical services. He was the only medical practitioner servicing Port Mellon to Halfmoon Bay. During this time, the only doctor in Pender Harbour had lost his license for malpractice. However, he was the only person with any medical knowledge in the area, and continued to practice illegally until 1920. As the Sunshine Coast grew, so did the need for more access to medical care. The Columbia Coast Mission Society vessel M.V. Columbia in Kingcome Inlet c.1930. This was a medical and hospital ship that also went to Garden Bay to drop patients off at St. Mary's (now shíshálh, or Sechelt) Hospital. ​In the early 1900s, the Columbia Coast Mission provided medical services to remote Sunshine Coast communities by boat. At this time, the primary industries on the coast were logging and fishing- it was these communities that pushed for a hospital. In Bright Seas, Pioneer Spirits, the authors described the conditions at that time. "In those days, loggers injured in Jervis Inlet or even down the coast as far as Halfmoon Bay would be taken by small boat to Irvine's Landing where they would have to lie in the freight shed until the next steamer arrived, perhaps a day later, in order to get to hospital in Vancouver. Too many of them died before a ship arrived and so the logging and fishing communities resolved that a hospital must be built in Pender Harbour..." The need for a hospital was met through the collaboration of the Columbia Coast Mission and St. Mary’s Church Parish in Vancouver. On August 16th, 1930, St. Mary’s Hospital opened in Garden Bay. It was a simple building with 12 beds, one doctor, two nurses, and two other staff. ​While convenient for camp workers, this location proved difficult for many residents of the lower Sunshine Coast as there was no land access to Garden Bay. It wasn’t until 1936 that the government road was connected to Garden Bay and Irvine’s Landing. And even with access to transportation, the road to Garden Bay remained unpaved and difficult to navigate. This meant that the lower Sunshine Coast had to rely on one doctor (Dr. Inglis) for medical care. As the population continued to increase, it became apparent that more medical services were required. The Gibsons Post Office at the corner of School Rd and Gower Point Road, before moving to it's current location. This building was purchased by Dr. Hugh Inglis in 1962 and became the first Gibsons Medical Clinic. 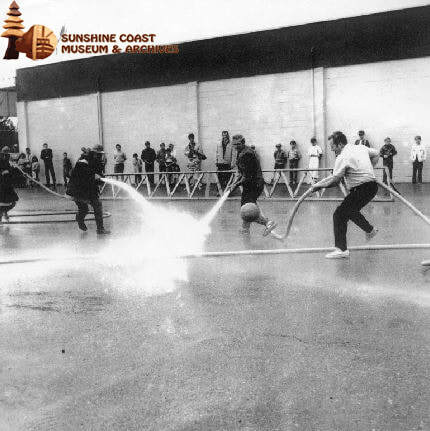 By the 1960s, the lower Sunshine Coast communities had grown significantly. Dr. Fred Inglis’s son, Dr. Hugh Inglis, had taken over the clinic at Stonehurst. But the population was rapidly expanding beyond the small clinic. The need of a bigger clinic was met by Dr. Hugh Inglis, who purchased and renovated the old Gibsons post office. In December of 1962, the Gibsons Medical Clinic was opened directly across from Stonehurst. Another doctor, the semi-retired Dr. Mackenzie, also opened a clinic near Soames Point. This provided the residents of Gibson's Landing access to more medical services without having to make the long drive to Pender Harbour. The community was quickly outgrowing the small rural hospital of Garden Bay and the need for a more centrally located hospital was recognized. According to Dr. Swan in House Calls by Float Plane, "Halfmoon Bay was considered the center of the lower Sunshine Coast, [and] the population hub was in Roberts Creek.” So in 1964, St. Mary’s Hospital moved to Sechelt. The new hospital was built on land generously donated by the shíshálh Nation, consisted of 35 beds and had a 13 bed nurse’s residence. However, as Dr. Paetkau notes in his novel, “the new hospital was already proving inadequate for the Sunshine Coast’s growing population”. By 1968, the number of patient days in the hospital had almost tripled (from 4,926 in '64 to 13,464). However, the move from Garden Bay to Sechelt did increase the availability of St. Mary’s Hospital services throughout the coast. Since then, it has continued to expand. The shíshálh, or Sechelt, Hospital was recently renovated and now has larger emergency, radiology, and maternity departments, single patient rooms, and 44 beds. When the new hospital opened, the Garden Bay location was closed, which sparked an outcry among the remote communities of the area. In Bright Seas, Pioneer Spirits, the authors noted that “many of [the residents] had volunteered labour or materials for the construction of the old building..”, and the loss of medical services had a huge impact on the area. Consequently, they rallied to open a clinic. And in 1976, they achieved their goal. The clinic moved to more centrally located Madeira Park, ensuring that everyone had access to services. At this time, growth on the Sunshine Coast became much more rapid. This development allowed an influx of medical professionals to the coast, as there were multiple employment opportunities. The historical record of medical care on the Sunshine Coast in the next few decades seems to die off. We had a community hospital, clinics in Gibsons, Sechelt and Madeira Park (and multiple private clinics that opened in the Sechelt area, mostly in the late '70s-'90s). As the population increased and communities developed, medical care grew. The availability of medical care has come a long was since the isolated hospital of the 1930s. The evolution of medical care on the Sunshine Coast is largely due to the community's dedication in implementing change- and our hardworking healthcare professionals. Without the efforts of these early Sunshine Coast residents, we wouldn’t have the access to the healthcare that we do today. Are you interested in learning more about local history? Drop by the SCMA with your research requests; we would be happy to help! Ever wondered how we maintain our film collection? Keep reading to find out! #1341: Both the negative and the photo have been preserved. This week, I’ve had the opportunity to continue working on an ongoing project here at the museum: film evaluation and preservation. This involves examining our photograph collections and assessing negatives for deterioration. An integral part of this process is Garry Morrison, our Image Technician at the museum. Garry has been with us here for 17 years, having previously worked as a professional photographer. Why is this important? This process is required in order to monitor any deterioration. As they degrade differently, the preservation of film materials can be complicated. There are three common types of film: nitrate, acetate, and polyester. Polyester (pictured above) is considered the only stable film-based material, while nitrate and acetate are not. When nitrate and acetate films deteriorate they can pose health and safety risks to people and surrounding collections. The Sunshine Coast Museum and Archives contains all three of these film-based materials, and consequently has to perform routine evaluations of all collections to ensure that they are being adequately cared for. Nitrate film was used from the mid-1880s until the 1950s. If not kept at a low temperature, it will begin to deteriorate. As nitrate degrades, it emits toxic fumes that are dangerous to both people and other collections. The gas that is emitted is also highly flammable, and high temperatures increase the risk of combustion. However, all archives at the SCMA are continuously monitored for changes in both temperature and humidity. So while our collections still contain a small percentage of nitrate film, very few show any signs of deterioration. With the popularization of cellulose acetate in the 1920s, the use of nitrate film began to decrease. Acetate, also known as “safety film”, was introduced as a substitute for nitrate. When acetate degrades it emits an acidic vapor. Though not toxic to people, it can damage surrounding collections. In order to track any deterioration that occurs, the museum performs a film-based inventory and evaluation. How do we do this? First, we pull a photo from the archives and check to see if it has a negative. Then, we can identify film type/base (nitrate, acetate, polyester). This is where things can get complicated- and this is where Garry comes in! With a background in photography, he knows exactly what to look for how to assess levels of deterioration. We begin by checking to see if the negative is a real, or just a copy of the original negative. Usually, a copy negative is an acetate copy of what was originally nitrate film. To do this, we check to see if there is any edge printing (words printed on the border), such as: “nitrate” or “safety” (acetate). A manufacturer/trade name (i.e.“kodak”) on the border signifies a polyester film base. Other techniques used for film type identification include “notch codes”: the shapes printed on the edge of the film. Nitrate film contains “V” shaped notches, while acetate film includes a “U” shaped notch printed on the edge. However, edge printing was not always used and notch codes are not always present (or intact). Therefore, we often rely on Garry’s trained eye to be able to differentiate between film bases. Nitrate or Acetate? Can you tell which is which? #2206: This negative is acetate! There are three "U" shaped notches along the bottom corner, and the words "safety film" printed along the edge. After we have identified the type of film, we can rate the level of deterioration. This is done though the use of a rating scale. The scales for nitrate and acetate are separate, because different processes occur as they begin to degrade. The deterioration of nitrate begins with the photo yellowing and the emission of nitric acid, while as acetate degrades it begins to curl and warp. The negative pictured below is in good condition, and it was given a Level 1 rating (no deterioration). ​ What do we do with all of this information? The inventory and evaluation process requires that the museum keep records of all our findings. This allows us to track the condition of our film-based collections to ensure the ongoing preservation of our collection into the future. Over the past several years, the museum has taken on a student during the summer months to help with extra visitors. This year, I will be joining the team! My name is Eva Miller and I’m the 2017 Summer Student for the Sunshine Coast Museum and Archives. I am currently in my second year of the nursing program at the University of British Columbia Okanagan. I was raised in Gibsons, and I’m excited to be able to spend my summer helping out at an organization so important to our community! Throughout the course of my time here at the Museum, I hope to learn more about the history of the Sunshine Coast, as well as further my understanding about what happens behind the scenes. Having little prior experience in archival/curatorial studies, the Sunshine Coast Museum and Archives is a fantastic place for me to gain knowledge in the processes that are taken to keep collections and exhibits cared for. During the summer, I will have the opportunity to learn more about research procedures, collections care/documentation, and database software. I’ll also be putting out blog posts on varying topics, including Nursing on the Sunshine Coast. I hope that my time here at the Sunshine Coast Museum and Archives will be a great way to learn more about the community that so many of us are lucky enough to call home. Drop by the museum Wednesday to Sunday and say hi! I just wanted to write a quick post on my last day of work here at the Museum. I wanted to let everyone know that I have had a wonderful time this summer. I have learned an infinite amount about not only technical aspects of Museum work, but about community involvement and communication. This summer has been full of fun adventures, like learning how to assemble exhibits and writing text panels, newspaper articles, and blog posts! I am extremely happy that the Sunshine Coast Museum and Archives decided to add me to their family this summer. I wanted to say a special thank you to Matthew, Margo, and Garry for working with me all summer long - it's been a wonderful experience and I hope to keep in touch for a long time! A special thanks goes to Garry for sharing his desk with me. To everyone else I worked with through the summer - though less closely than those I shared an office with - it was such a pleasure to meet and get to know you. I look forward to visiting Gibsons again and knowing that I may run into you on the street! And thank you - the Museum visitors - for making this such a wonderful summer. It would not have been so successful without your continued support to the Museum. “What the heck is Pokémon GO! ?”, you may ask. You’ve probably been hearing about it everywhere. People of all ages, all over the world, have been playing this game, and small businesses everywhere have been taking advantage of that. Pokémon GO! is a smartphone game that allows players to walk around and, in real-time, catch small animated creatures named Pokémon. These creatures are based off of real-life animals, and appear on your phone screen either on a pre-set screen or in augmented reality. 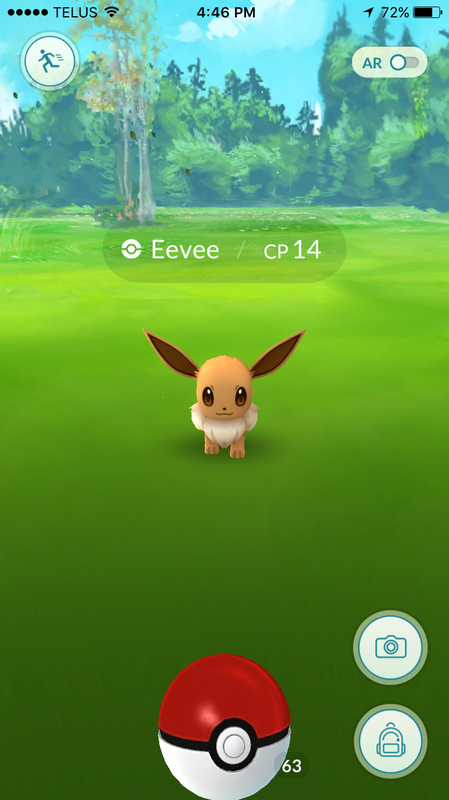 Appearing in augmented reality simply means that the app connects to your camera so that the Pokémon can appear on the scene in front of you. Fig. 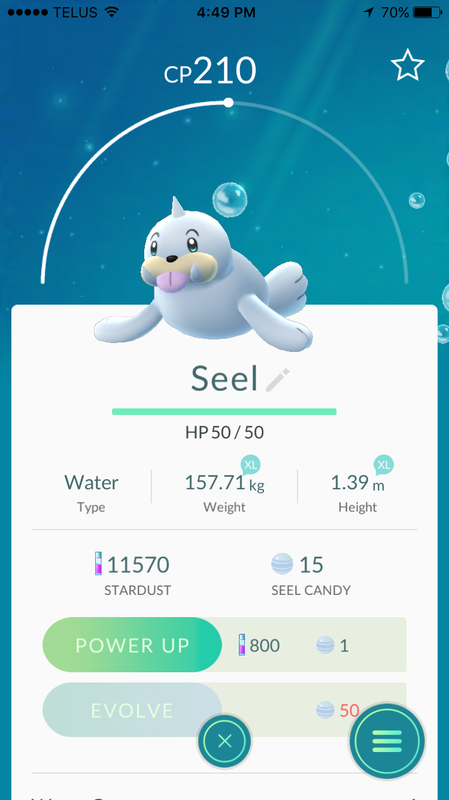 1: The "Seel" Pokémon, based off of a real-life seal. Fig. 2: The "Eevee", based loosely off a dog. This is an example of the pre-set Pokémon catching screen. Fig. 3: The "Weepinbell" is based off of a buttercup flower. 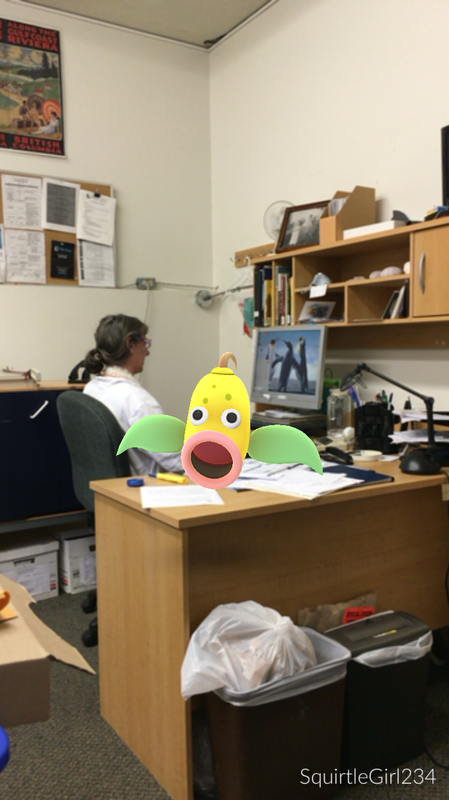 This is an example of Augmented Reality - the Weepinbell is on Margo's desk! But why is this important to Museums? How can we use this gaming application to our benefit? The Pokémon franchise is unique in that it appeals to everyone. The traditional ‘console' games are marketed and made for children around 10 years old – the protagonist of the games and TV show is a ten year old boy. This emphasis on younger children also contributes to making the games easy to play and learn. What makes the games cross-generational is the fact that the first game came out on February 7th, 1996, establishing a large number fans and well-loved games and characters. The franchise continued to gain popularity and now, twenty years later in 2016, this large, multi-generational following has made Pokémon a global phenomenon. Adults (who were the first children to love the games) and children alike play each game that comes out. This long history of popular games made it easy for Niantic and Nintendo to market the Pokémon games, and especially Pokémon GO!, to people of all ages. Fig. 4: An example of a traditional 'console'. This is the handheld Gameboy Advance of the early 2000's. Fig. 5: This is what looking for Pokémon looked like in the old games. You would search through tall grass to find Pokemon. Fig. 6: This is the new Pokémon GO!. In this game, all the green areas are 'tall grass'. This accessibility to all ages is exactly what the Museum strives for. I have written about the importance of Social Media in Museum work before and this application definitely falls under that umbrella. Because Pokémon GO! is so widely used and so wildly popular, it is important that we, as a Museum, understand and utilize it. If you’re interested in why Social Media is so important to Museum work, check out this blog post for more information! With that being said, how do we go about utilizing a gaming app to benefit the Museum? Luckily, the way the game works makes that easy for us. In-game there are set places in real-life that the game has labeled as Pokéstops. 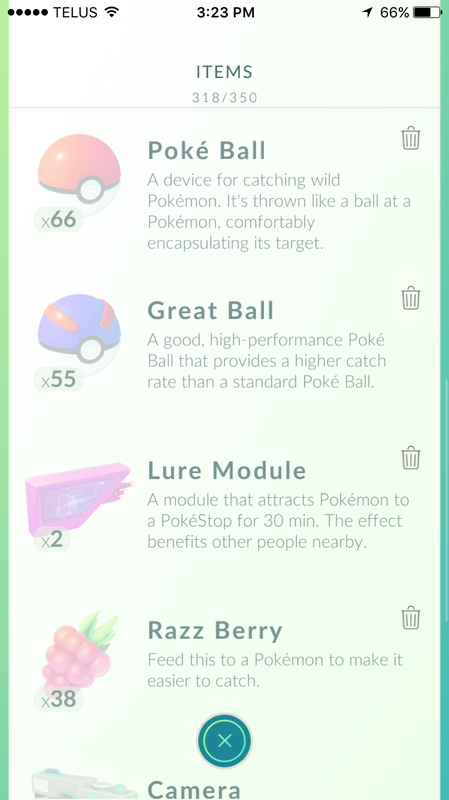 These stops provide you with items that are essential to playing the game – things such as Pokéballs for catching Pokémon, and lures for attracting Pokémon. Pokéstops are the cultural, historical, and geographical landmarks that I mentioned before. Each Pokéstop has a picture so that you can make sure you’re in the right place. Museums count as a historical landmark, and are usually counted as Pokéstops! Ours looks like this (picture example). By promoting that we use the game through other social media posts we can prove that we are accessible and interesting to all age groups. As an added benefit, Pokémon often appear near these Pokéstops! Fig. 7: The Sunshine Coast Museum and Archives as a Pokéstop. Fig. 8: An example of the type pf Pokémon that may appear near Pokéstops. The "Vulpix" is modeled after a fox. Fig. 9: A list of items that Pokéstops give you. The items are randomized so you don't get the same items every time. Another way for us to use to app is one that is already widely being used by popular Museums such as the New Westminster Museum. These Museums are organizing ‘Pokémon GO!’ walking tours, similar to what we do with Dale here at the Sunshine Coast Museum. The tours are advertised widely both on and offline, and are targeted towards those with the Pokémon app on their phones. As I mentioned before, Pokéstops are usually places of historical, cultural, or social significance. These are the same places that walking tours go to! This creates a perfect opportunity for modern technology and history to combine in one fun turn activity. These tours have also proved to be wildly popular, pulling out some of the biggest groups that have ever attended these yours. Fig. 9: An advertisement for a Pokémon Tour in New Westminster, off their website. All in all, Pokémon GO! is a fun, accessible way for people to get out of the house. It provides a sense of community, and presents a great opportunity to learn about history and culture. Fig. 1: An elderly Hubert Evans standing outside his home in Roberts Creek. While working in the Museum I often came across a certain name: Hubert Evans. As some of you may know, we host his boat here in the Museum, but we didn’t have much other information about him. After receiving a number of questions about the nature of the man who built the boat, I decided to find out. I have compiled my findings here for you to read as well: hopefully this will shine some light on the mystery that was Hubert Evans! Hubert Evans was born in 1860 in Vankleek Hill, Ontario, to William Edwin Evans and Frances Alberta Evans (nee Taylor). A year later they moved to Galt, Ontario, where Edwin took up a job as a schoolteacher at the Galt Collegiate Institute. All three of Hubert’s younger brothers – Charles, Gerald, and William – were born in Galt. In later interviews Hubert maintained that there were two main things that his parents instilled in him from a very young age: a love of nature and a love of literature. His father would often take the family on camping trips and outdoor explorations, collecting nature samples and observing wildlife. They were also often read to – Edwin would read from the Bible (as a devout member of the Galt Methodist Church that was not surprising), while Frances (their mother) would read from more fantastical works, most notably the popular children’s novel The Water Babies. This love of literature came to fruition for the first time when Hubert won a Lipton’s Tea limerick contest for $1 when he was nine years old. These two differing values created a lifestyle that Hubert followed his entire life: a careful balance between mental and physical exertion. For every written word came something done by hand. Fig. 2: An example of the outdoor work Evans enjoyed doing. Here he is pictured dredging out the mouth of Roberts Creek, with friend George Klein on the tractor. After dropping out twice, Hubert graduated from high school and enrolled in the University of Toronto’s forestry program, but never attended. He became the only one of his brothers to not attend University: Charles went on to be a geologist, William became a director of processing at an engineering company, and Gerald became the Head of the Department of Pathology and Laboratory Medicine at the University of Minnesota. This lack of university education does not mean that Hubert was unsuccessful. He became a journalist at the age of eighteen, something that he always said was imperative in developing his writing style (succinct and to the point, but interesting and engaging). Journalism was something he greatly enjoyed, but after his time in the military in WW1 [as a signaler then a lieutenant of the Machine Gun Corps,] he found himself wanting something different. After a chance meeting with an old friend at a train station, Hubert found himself on his way to his new job and life in the fisheries of Lakelse, BC. The very next year Hubert married his high school sweetheart, Anna Emily Winter. They had been faithful pen pals ever since their initial meeting in Galt when they were thirteen, even as he journeyed through journalism and military service, and as she graduated from the University of Toronto. With a similar “…own only what you can carry on your back” attitude in addition to this long history, it was no surprise that they eventually married (pg 11) . The official ceremony took place on June 29, 1920, in front of ten witnesses, but the lovebirds had their own private ceremony a few days before. Fig. 3: An image of Anna from Alan Twigg's biography of Hubert Evans. Found on page 50. ​ Soon after the wedding Hubert became disillusioned with his increasingly bureaucratic fishery position. This prompted their decision to find somewhere to live along the Coast – from 1920 to 1927 they were on the move. They camped on the beach, stayed with friends, and lived in Cultus Lake and North Vancouver for a couple of years. Their first two children, Elizabeth and Joan, were born during this period. Their son Jonathan wasn’t born until 1930, three years after they had finally settled in Roberts Creek. Through the years of the Depression Hubert set writing aside to focus on providing for his family. 1932 was the year he began commercial fishing. He used a technique called ‘hand-trolling’ and fished out of his handmade double-ended handliner – the same one that is on display at the Museum. Contrary to popular belief he did not make the boat on his own. He had a close friend and fellow fisherman help him over the course of a winter. We all know that handtrolling was a huge part of life on the Coast – it was how many people survived through the tough times of the depression. Local researcher Larry Westlake is the leading man when it comes to information on hand-trolling traditions on the Coast. Not only does he have many first-hand accounts of Coast fisherfolk but he has also built a fully functional replica of Hubert’s handliner. Fig. 4: An image of Hubert Evans standing beside his handmade double-ended handliner after a fishing trip. ​ Eventually, Hubert was able to write as well as fish for a living. In 1949 he started publishing his writing again, writing everything from novels to newspaper serials. Most popular are his works Mist on the River and Son of the Salmon People, which address the struggle of First Nations youth as they try to balance traditional customs and values with the unyielding encroaching Western cultures. Lesser known, but just as impactful, are his works in poetry, plays, and newspaper serials. At the end of his career By the end of his career Hubert Evans had published 21+ works, and was the quintessential “Coast Man”. He could write, read, build, and fish with the best of them. In addition to this, he had educational achievements: in 1981 he was the recipient of an honorary doctorate by SFU. In true Hubert Evans fashion he refused to make the long trip to the SFU campus, so the committee went to his small home in Roberts Creek. There was also a literary prize named after him: the “Hubert Evans Prize”. It is awarded to the top British Columbian non-fiction writer of the year, every year, in Vancouver. Fig. 5: An image of Evans and friend Margaret Laurence at Evans' honorary doctorate ceremony in 1981. The picture can be found on pg 108 of Alan Twigg's biography. ​ If you have any questions about Hubert Evans, his boat, the handtrolling tradition, or his writing, please come into the Museum! We would be happy to answer your questions. ​Twigg, Alan. Hubert Evans: The First 93 Years. Madeira Park, BC: Harbour Publishing, 1985. Print.